Trials - involving another 2,500 women - are expected to take place next year at a major London teaching hospital and major hospitals in Barcelona and Paris. 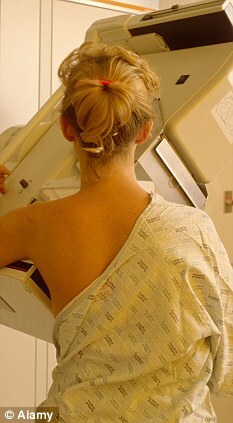 Scientists at Real Imaging - the Israeli inventors -have discovered that women with breast cancer produce different signals on the surface of their skin which is detected by the machine without coming into contact with the breast. The new machine - which was tested at major university hospitals in Israel -was found to be as effective at finding cancers in younger woman as older women. Dr Eugene Libson, a radiologist at the Hadassah University Medical Centre in Jerusalem said: 'Mammography is an old fashioned technology which requires examination of x rays by the naked eye.